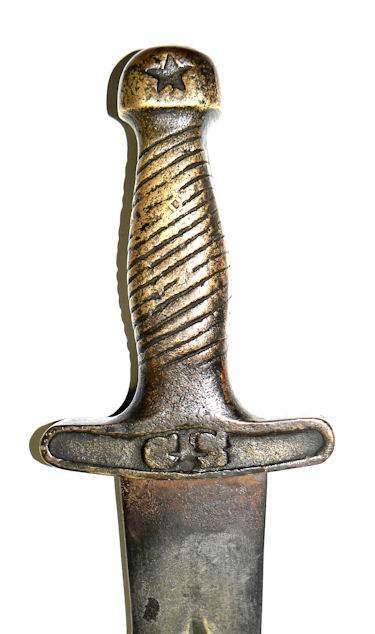 To view our current inventory of Civil War and other antique weapons, click here! This Interesting Artifact Has Been Sold. 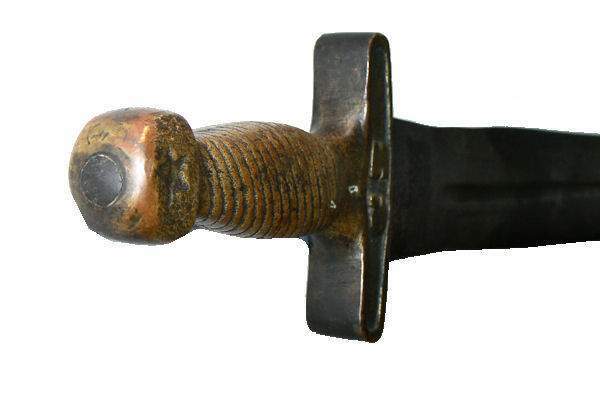 Blade 18 5/8" L x 1 3/4" W x 1/4" T at widest LOA 24"
Presented is a rather roughly made short sword with a prominent CS on both sides of the cross guard and a star on both sides of the pommel which is a careful recreation of swords selling for many thousands of dollars. Like the original, it is has no maker's mark, and there is no scabbard. The sword came from the collection of a southern gentleman and nothing else is known about its history, but it is a well made copy and not authentic. None the less, the scarcity of the real swords of this design makes this a worthwhile addition to those that fancy Confederate Civil War relics, but can't afford them. For example, there are two swords of the style with these same markings on the internet. One is priced at $12,500.00 and the other at $9500.00. DIMENSIONS: The blade is 1 /4" wide at the hilt and 18 5/8" long. There is a long wide "fuller", starting 5" above the point that is 13" long. The hilt is 4 1/2" long, 1 1/4 wide and 7/8" thick. The entire hilt is cast brass. The grip is molded with a decoration that looks like a continuous strand. The quillions is a straight cross. There is an STAR imprint on both sides of the pommel. CONDITION: The blade has some slight pitting and darker grey spots with with some of its original nickel plating in evidence. On the reverse side there is some small links, and prints that have been transferred to the blade. Both edges are sharp. The blade is solid in its handle. SHIPPING & PACKING is included in the cost. 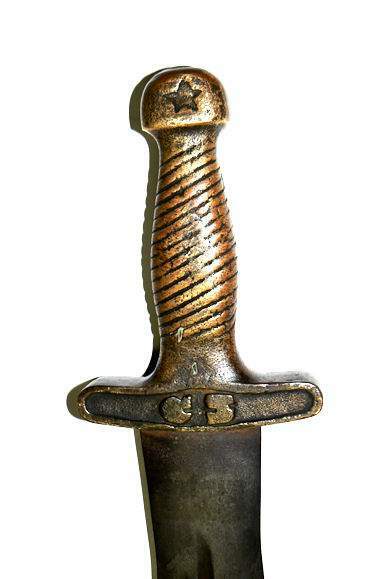 Confederate swords are very scarce and should appeal to the most sophisticated collector who desires the most unusual.